So what food did I miss the most whilst in Asia? Surprisingly or maybe not so surprisingly, I didn’t miss the European food a lot during my 3 months. I didn’t get tired of the rice at all. When I was a little girl my only sources of carbohydrates were rice and pasta, no potatoes. So perhaps I was biased but the rice comes in so many variations and is so delicious. Really I missed it within the first week that I was in Belgium! All the wonderful stir fries is another thing I never got tired of. A dish prepared so fresh… On every corner of the street you can see them make it right in front of your eyes. No cheating, no reheating! Anyhow, I’m getting sidetracked. I was wondering what I missed when I was there in Asia from here. I would have to say nothing except a nice glass of Bordeaux with a delicious piece of smelly French cheese and a crispy baguette. It’s not something I eat often when I’m in home. But it’s something one could always eat if one wants it. And it’s my favourite holiday food; on a cold winter night in the Alps or a warm summer lunch in the Provence. You always have good red wine in your cellar and a piece of cheese in your fridge. As for the baguette it can be a little trickier to find a good one in some countries. But it’s still easily bought on the corner of the street. Last night I made something different. Something I didn’t think of when I was there. Now that I had it last night, I realized it’s something I couldn’t live without. It’s something I think everybody should have on his top ten favourite desserts. There are various reasons why it should be up there with the chocolate cake and the crème brulée. It’s by far the easiest dessert to make. I’m not a big patisserie fan because patisserie equals chemistry, scales, precise measuring… All things I’m not very good at. I like to cook with feeling, as learned from my mentor Jamie Oliver. I have no real school or technique. My only consistency in my cooking is that it’s homemade. From the bread to the ice cream to the pesto or the hummus…What I produce depends greatly on my mood, my time schedule, the content of my fridge, the season, the weather, the guests… In desserts there is often little room for such nonchalant frivolities. The Crumble however is one of those exceptions that confirm the rule. It’s dead simple to make. It doesn’t need any scales, it doesn’t need the perfect working oven, it’s totally dependent on what fruit you have in your fruit basket or garden. And most importantly every single guest will absolutely love it! I have yet to meet a person who is no fan of it. Even my big brother who is not a fan of desserts loves this. Also I’m still looking for a person who can’t reproduce it. You can serve it at a fancy dinner party with some raspberries (to price it up) in beautiful individual serving pots. Or you can serve it at a kid’s birthday party with apples from the garden in a big baking dish so they can help themselves to more and then some more! If we are still at the fancy dinner party, some homemade salted caramel ice cream fancies it up even more. Or as I prefer it, comfort food all the way, serve it with double cream. 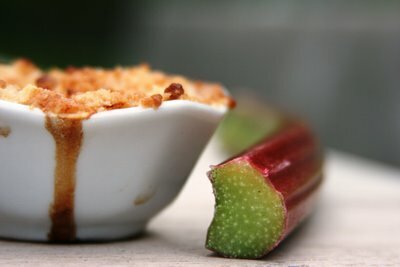 Last night I made it with some beautiful rhubarb from Annie’s garden. And just one juicy peach to balance out the sourness. You have the warm melted sweet sourness of the fruit, combined with the crunchy crumbly sugary dough, finished of with ice cold double cream or ice cream. It’s heaven! And I could even find all the ingredients in Asia and make it there! If only I had thought of it before! fruit of your choice enough to fill an ovenproof dish of 25cm diameter. Mix flour, sugar and salt with butter to a crumble. Peel your fruit and dice it in bite size pieces in your ovenproof dish or individual serving pots. Top the fruit with the crumble mix. I told you it was easy!Put in an oven of 200°C for 30-45 minutes until crispy golden. je blog is een fantastische verrassing, niet enkel voor de papillen maar ook voor de neus… Ik zit hier in Bogota, en eerlijk gezegd driften de geuren in illusoire wolkjes voorbij die me doen watertanden! Ik mis inderdaad onze continentale lekkernijen, en met je liefdevolle beschrijvingen nog meer! 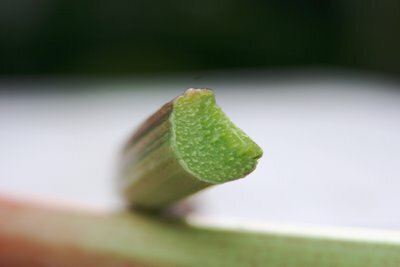 Prachtige fotos trouwens, en je verhaal over Bloch en Peeters heeft me inderdaad triestig gemaakt, maar we mogen de hoop niet verliezen, er blijven mensen zoals jou met een echt ambachtshart rondlopen! Ik kom in de zomer terug, het zou fijn zijn eens na zoveel jaren met een goed glas wijn de late zomeruurtjes met verhalen op te vullen! I had the privilege to taste Ariane’s rhubarb crubmle with speculoos ice-cream. It was absolutely scrumptious!